Mothering with Creativity: Earth Day Dirt Cups to the Rescue...Again! 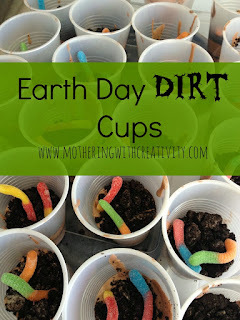 Earth Day Dirt Cups to the Rescue...Again! It's almost Earth Day. Want to know how I know? It's not because it's on my calendar (because I have a plain, no holidays listed calendar). It's not because I just remember the date (I can't remember any holiday dates). My only heads up to Earth Day popping up just around the corner is that my Earth Day Dirt Cups recipe starts being viewed a ton each day! I seriously love this recipe, and love that all of YOU love it too! It is now the 4th most viewed post on my blog with almost 20,000 views, and has been pinned over 18,000 times! And the haters-oh the haters! Did you know I have quite a few haters because I served these dirt cups in clear, plastic cups on EARTH DAY!??!?!?! I know, what was I thinking? Whatever-haters gonna hate. Winners gonna have tasty desserts. Anywho...dirt cups. These are an Earth Day MUST. Not kidding. I've been doing them yearly since I was a small child. They're simple, easy, can be kid-made, and are SO much fun for kids. They are totally not healthy (duh), but are a fun little treat to serve. Want to check out the how-to for this recipe? Head on over HERE to find it!